Lewis Stevenson, Matt Thomas and Darren Pfeiffer have played in the 2013 SANFL Grand Final team. Port Adelaide got through Saturday night's 24-point elimination final win over Collingwood with no injuries. 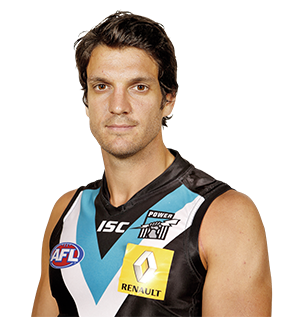 An elite football journeyman, Pfeiffer came to Port Adelaide in the 2012 Rookie Draft and played his first senior game in Power colours against Collingwood in Round 4. A capable defender who adds flexibility to the midfield, he was awarded his first Brownlow Medal vote against the Kangaroos and played sixteen games for the year. Pfeiffer grew up in Birdwood and came into the AFL through Carlton and was later traded back to the Adelaide Crows. With several dominant performances in the SANFL under his belt, Pfeiffer played his first game for the season against Collingwood in Round 4. His best performance came in Round 8 against North Melbourne and Round 10 against Carlton as a defender capable of floating forward and providing options through the midfield.